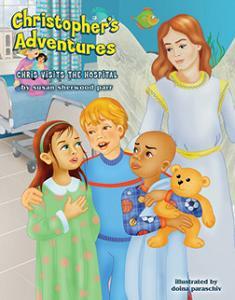 New book tells critically ill and sick kids that "God Loves Them and Cares..." Chris falls asleep and in his dream goes with the angel Matthew to a hospital on a mission. In a delightful rhyming adventure, Chris tells them that God cares! Author Susan Sherwood Parr is the president of Life to the World Ministries, Inc.. Help us get these books into the hands of children and families who need to hear: "God loves you..."
She is a Harvest Show and Sky Angel television guest and radio guest. This newest book happened as a result from watching a St. Jude`s special in which a little girl asked the question: "Does God hate me?" Susan, a national Bridge-Logos author also has over 13 books of her own on prayer, a prayer book given out by the Pentagon Chaplain`s Office, and the new: Getting Contrary Out of Mary and Getting Miss Muffet Off Her Tuffet for WOMEN. Help us get these books into the hands of children and families who need to hear: "God loves you..."